Alicen is always helpful in finding a property to suit our needs, much better than the internet companies. She responds to our requests quickly. This is an extremely nice house in a great location, just around the corner from restaurants and shopping. The beds are very comfortable and supportive. The kitchen is well equipped and the house is updated throughout. The view of Harris Lake is spectacular, especially at sunset! We loved our stay at Wonderfall Cottage. The scenery is beautiful and the views if the mountain and waterfall are amazing. The house is very comfortable with all the ammenities we needed including wifi and having a separate guest house is great for a large family. We will definately rent this cottage again! We were well informed in advance on how to check in and what to expect from our property. I was contacted the day before our arrival to make sure we had all the information we needed. We arrived after hours and check in went smoothly; thank you! Our stay at Dancing Bear was great. The property was as advertised. We really enjoyed the outdoor porch and fireplace. The location was great! Cozy, clean mountain cabin! Better than expected. Loved this house! Very comfortable and beautiful mountain home. Love the location close to town. Our group enjoyed hanging out on the back porch around the fireplace. The kitchen has all you need to cook a good meal and the beds are comfortable. We will be coming back. Thanks for a great weekend. " Perfect house, Perfect view!! We loved that there was a bedroom in each corner of the house which gave everyone ample privacy. The kitchen has two ovens which was great for cooking for Thanksgiving dinner. Also the kitchen was fully stocked with ample appliances, bake ware and dinner ware. We were so impressed and also loved the outdoor screened porch with fireplace and TV. Alicen Phillips went above and beyond to ensure our stay was comfortable and full of great mountain memories! I would recommend this house and Alicen Phillips as the rep to future visitors to the Highlands! This was our first visit and we absolutely loved it. We will return again for sure!! Very comfortable home. This home was much nicer than the pictures show. Great space and very comfortable. It had everything we needed and very conveniently located. The Soaring property was just Awesome. It far exceeded any expectations we had. First Class all the way, comfortable for everyone, and just so cozy even though house is huge. Could not have possibly stayed in a more beautiful house, and the view simply takes your breath away! We will certainly be back. Alicen and her profession staff handled every thing with exceptional professionalism and were exceedingly warm and friendly, check in and check out was a breeze. Thank you for making our family vacation the very best it could possible be.Cannot wait to come back! Alicen was very helpful and friendly. So much fun. We will be back! Mountain Mooring is a great property. 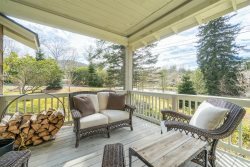 Updated, cozy and secluded yet just a few miles to everything in Highlands. Our family loved it... space for everyone yet gave us awesome quality family time. We would stay here again. Great House! Beautiful house with nice kitchen and bathrooms. Beds in both bedrooms were very comfortable. Perfect for a relaxing mountain getaway and convenient to town! Alicen Phillips was professional, courteous and helpful while we were securing the property and during our stay. The property was very comfortable and the covered back deck was wonderful! Check in was a breeze! Had a wonderful time. Family ranged in ages from 2 years to 89 and everyone enjoyed the property.